Melissa & Nick’s Wedding Film from Mystic Image Productions on Vimeo. Melissa & Nick’s Wedding Film with Catholic Wedding Ceremony at St. Gabriel in Mentor Ohio with Rev. Gerard Gonda celebrating the Sacrament of Marriage. 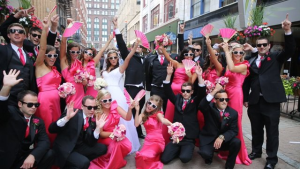 Over-the-top Wedding Reception at LaMalfa in Mentor Ohio.